We are walking to the abandoned sniper tower in the center of Mostar when she says it. “I love how Christians and Muslims live in peace here,” she said. My mouth almost dropped open. Does she even know what happened here? Later, she takes selfies while leaning on a ledge that guns rested on around the clock as Serbs and Croats picked off Muslim Bosniaks back in 1993. For me, 1993 is the year when my sister was born. It was the year I became obsessed with the Jungle Book, fancying myself a young female Mowgli, turning over stones looking for grubs. It was the year I tried and promptly failed out of ballet. But in the Balkans, 1993 was the year that brothers, fathers, and sons all turned to dust. 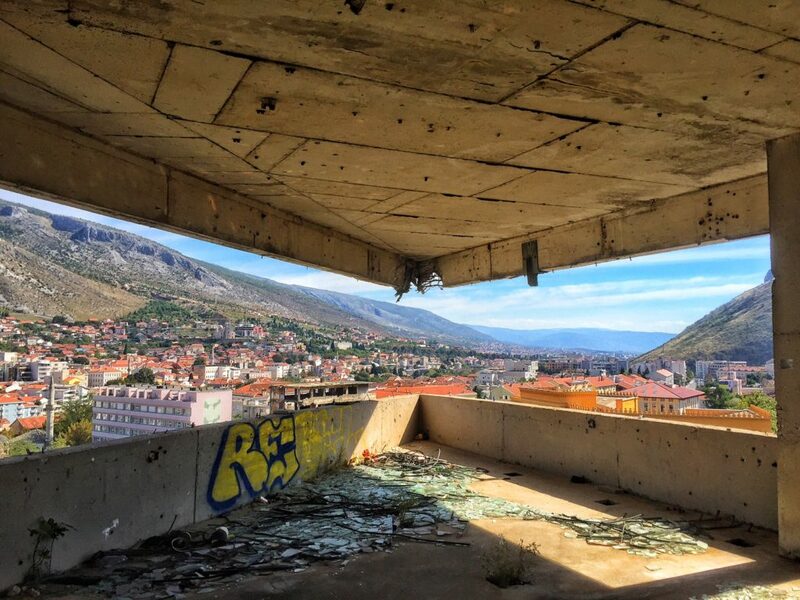 And nowhere is this more clear than in Mostar, war ravaged and pockmarked from shells even decades later. It was the year that people who had been living together, if not in peace at least in détente, suddenly all turned on one another. It was the year their neighbors took to the hollowed out shell of Ljubljanska Bank to shoot them, carelessly, as if for sport. Like beer cans set up at a home shooting range. 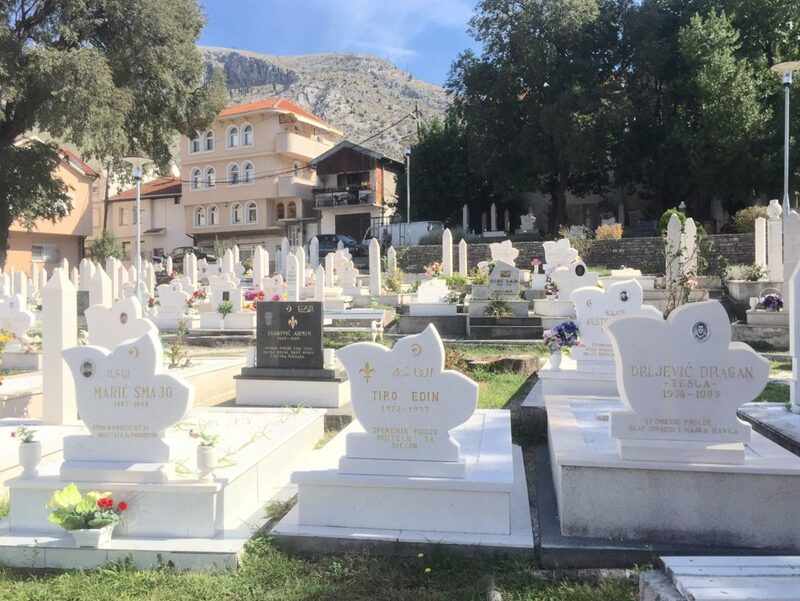 Sitting in the graveyard of the mosque on the Muslim side of Mostar, I’m surrounded by gravestones, all erected in 1993. By now, I know the numbers of the war; I know that almost 2,000 people – nearly all men and boys – met their end in the Mostar siege in that year; I know that over 8,000 died in Srebrenica; I know that almost 100,000 people died overall in these terrible years; I know that tens of thousands of Bosniak women were kidnapped, tortured, and raped as a means of ethnic cleansing. But even surrounded by these stark reminders of all the lives lost in 1993, none of these facts feel like anything. At least, it doesn’t until I see an old man with his head buried in his hands. Even not seeing his face, I can tell. Sadness is present in the grip of his fingers on his temples, the curve of his spine, the way his shoulders tremble. Without asking, without having to ask, I realize he must be the father of one of these gravestones. And I shatter inside. Sometimes the only number that matters is one. Leaving the sniper tower, I exist in a kind of a daze. How many snipers had laid in wait where I walked? How many lives were taken on this very block? 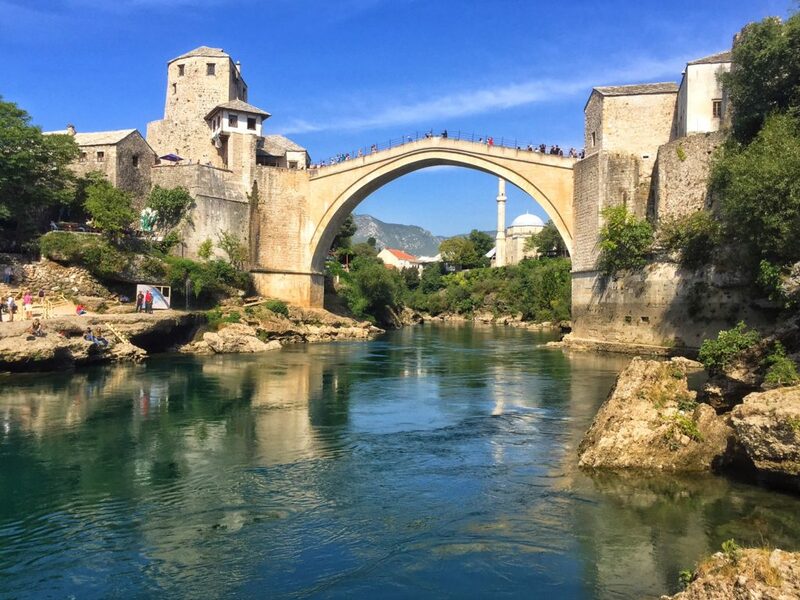 As I cross the Old Bridge (a misnomer, as it was bombed to pieces in 1993, effectively herding up all the Muslim Bosniaks for easier picking off, and only rebuilt in 2004) I am filled with a sudden, irrational anger with all the tourists around me. I scowl at someone buying a cheap magnet. A tour group parade squeezes through the souvenir shops, looking more at their selfie sticks than their surroundings. I want to shake them by the shoulders, shout at them: don’t you know what happened here? Don’t you care about what the war did to Mostar? But of course, I am here. Don’t I know what happened? Don’t I care? Am I really any better? Me, this tragedy tourist? By not buying that god awful magnet, by not putting money in the pocket of someone who lived through those terrible times, how am I really any better? Some of Mostar has scarred over. Some wounds are still open: bombed-out buildings left standing even 23 years later, moreso on the Bosniak side of the river. They look like the smile of someone missing half their teeth. 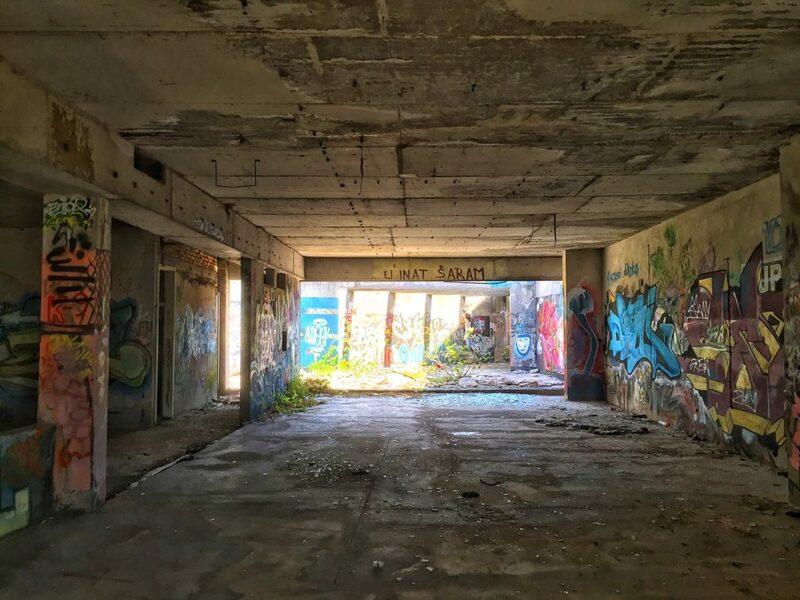 But to paint a picture of Mostar as nothing more than a war-ravaged shell is unfair to the city and even moreso to its citizens. Bosnians are tough. 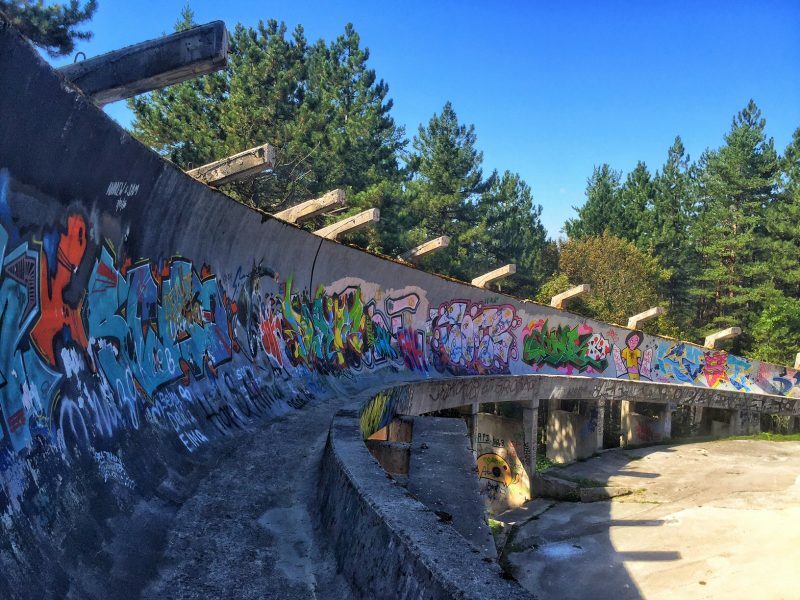 The Sarajevo Film Festival began in 1993, while Sarajevo was under siege – no food, no running water, no electricity – just backup generators and the willpower not to let the war run their lives. 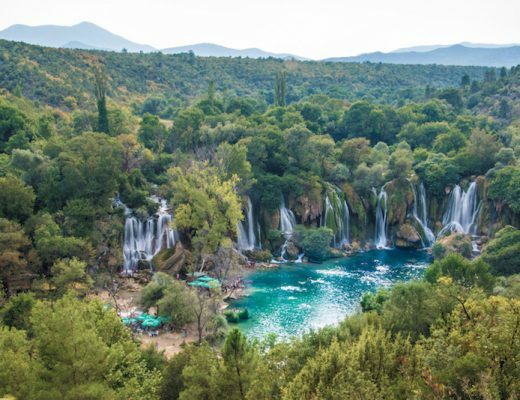 In short, the people of Bosnia are resilient. They have passions, desires, dreams, stories. They are not just victims. They drink strong Bosnian coffee overlooking Stari Most. They play backgammon and chat with their friends. They laugh over massive quantities of grilled meat. They smile with bemusement at the outsiders who come to visit their city. They share massive 2 liter bottles of beer with their friends on the banks of the river. They gather each year to watch the artful arcs of the cliff diving champions twisting and tucking as they dive off the famous Mostar bridge. They drink rakija and dance into the evenings; like us, they love, laugh, and dream. 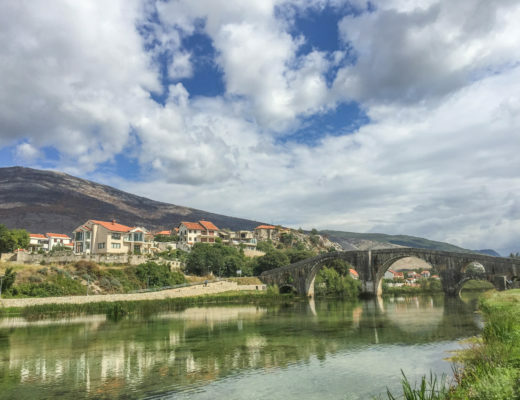 Mostar may be a city built on a graveyard, but it is not a ghost. Enjoyed the post? Pin it or share! 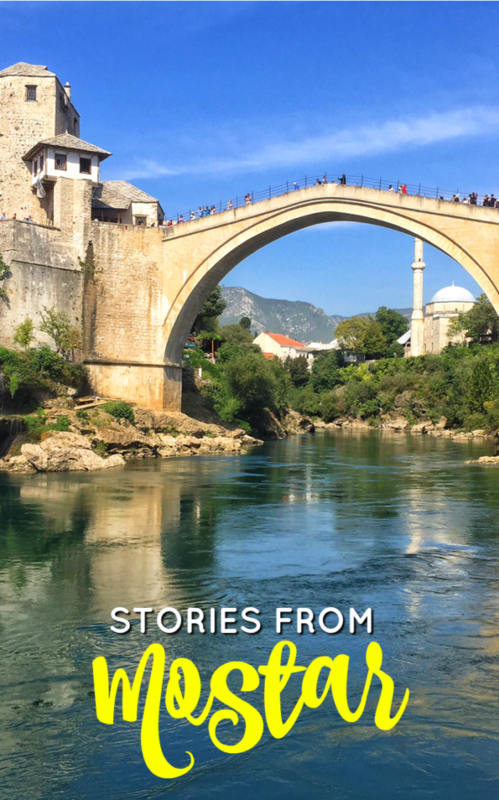 I love the way you told this story… reflects a lot of the emotions I had while in Mostar. It’s a difficult place, but also so beautiful. Thank you Kate. A simple guide or top 10 post didn’t feel right. I’m glad you could relate and enjoy the story – thanks for your comment! 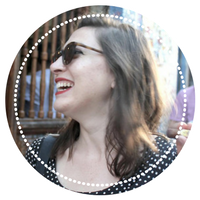 This is a beautifully written post Alison, really enjoyed reading it. 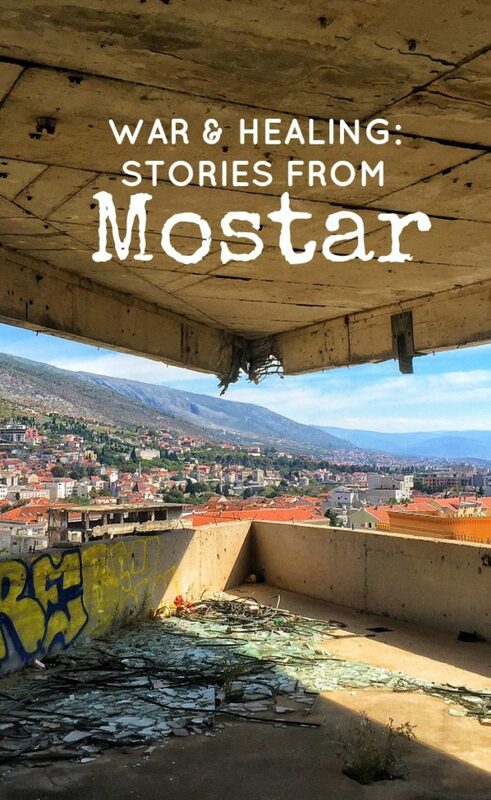 I found Mostar absolutely fascinating – we went to that sniper tower too but at night so didn’t get any pictures. Thanks so much Janet, that means a lot to me! I quite loved Mostar as well. Oh man, the sniper tower must have been so freaky at night! I was terrified of falling through a gap even during the daytime. Never understood vertigo before until going to that tower! Beautifully written. I’ve visited Mostar few times but never experienced it from the sniper tower. Big respect. 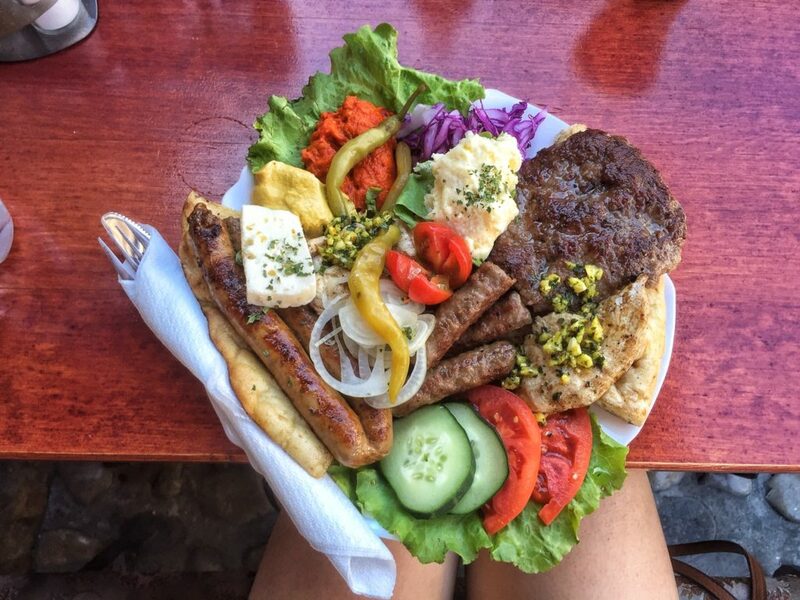 It was about $7, I think — Bosnia is not great on vegetarian options, though, sadly!